Introduction: Programmed cell death-1/programmed cell death ligand-1 (PD-1/PDL-1) inhibitors are the newest class of approved drugs for advanced urothelial cancer (AdUC). This review aims to collate the evidence for their efficacy and safety in various treatment settings. Methods: Extensive search of databases was performed (updated May 2018) and the protocol was registered on PROSPERO (CRD42017081568). The review was conducted according to the Preferred Reporting Items for Systematic reviews and Meta-Analysis statement. STATA (v 12) and Revman 5.3.5 were used for data analysis. Results: Ten nonrandomized, open-label clinical trials were included in this review. PD-1/PD-L1 inhibitors were used as second-line, stand-alone in eight trials and as first-line in cisplatin-ineligible in two trials. Heterogeneity was observed for study design, PDL-1 testing methods, cutoff criterias used and translational markers evaluated. The pooled objective response rate (ORR) was 18.2% (95% confidence interval [CI] 15.1–21.2, n = 1785) with PD-1/PDL-1 inhibitors in second-line settings as compared to 12.6% (95% CI 10.3–14.9, n = 736) with second-line chemotherapy and 23.7% (95% CI 19.9–27.4, n = 489) with PD-1/PDL-1 inhibitors as first-line therapy in cisplatin-ineligible patients. The median progression-free survival and overall survival was similar with PD-1/PD-L1 inhibitors in both second- and first-line treatment settings (1.5–2.9 vs. 2.0–2.7 months and 7.9–18.2 vs. 15.9 months) and second-line chemotherapy (3.3–4.0 months and 7.4–8 months). Odds of achieving ORR was 0.10 (95% CI 0.03–0.31, n = 229) in the second-line, stand-alone setting with a combined positive score (CPS) cutoff of 25% and was 0.34 (95% CI 0.19–0.62, n = 265) with a CPS cut-off of 10% in first-line setting in the cisplatin-ineligible. Conclusions: PD-1/PDL-1 inhibitors appear to be promising in the treatment of AdUC and CPS may be a potentially reliable biomarker for predicting response but needs validation. Caution needs to be exercised until more data are available on imAEs and further studies are required to prove their worth as the standard of care. Urothelial cancer (UC) is the ninth-most common malignancy reported worldwide., Advanced UC is highly lethal. The current standard of care, platinum-based combination chemotherapy, was approved three decades ago., The median overall survival (OS) with cisplatin-based therapy is 12-15 months and is about 9 months for carboplatin-based treatment. Patients who do not respond to the first-line treatment have a median OS of only 5–7 months with the available second-line treatment options. The commonly used second-line chemotherapy, paclitaxel or docetaxel are effective in about 10% of the patients, and the response is often partial and short-lived.,,, Therefore, there has been an unmet need to develop new therapies for these patients. With years of research, it was found that the malignant cells might escape immune detection by exploiting the immune checkpoint, programmed cell death-1/programmed cell death ligand-1 (PD-1/PDL-1) pathway that suppresses T-cell responses. Therefore, it was conceptualized that blocking PD-1/PDL-1 pathway may cause prolonged T-cell activation and tumor rejection.,, Monoclonal antibodies against PD-1 and PDL-1 are the newest class of drugs available for the treatment of advanced urothelial malignancy (AdUC). The first drug in this class, Atezolizumab, was approved by the US-Food and Drug Administration (FDA) in May 2016. Subsequently, four others, namely nivolumab, durvalumab, avelumab, and pembrolizumab have been approved. All of them have been labeled as second-line agents to be used if disease progresses with platinum-based regimens. Only atezolizumab and pembrolizumab are indicated for use as first-line agents when cisplatin use is contraindicated. These drugs are expected to change the treatment landscape of AdUC. Therefore, it is essential to critically examine the extent of therapeutic benefit and the predictive markers of response as well as the adverse treatment outcomes with this class of agents. The objective of this systematic review is to synthesize the existing evidence assessing the overall efficacy and safety of the currently approved PD-1/PDL-1 inhibitors in AdUC. The protocol was registered on PROSPERO (International Prospective Register of Systematic Reviews, CRD42017081568) and is available on the University of York website. Identified reports were reviewed according to the Consolidated Standards of Reporting Trials. The Preferred Reporting Items for Systematic Reviews and Meta-analysis were adopted for conducting the review. Three authors SD, RR, and NJ independently performed the electronic database searches starting from January 1, 1980 to December 31, 2017 and were updated through May 2018. The databases included the Cochrane Central Register of Controlled Trials (CENTRAL; Wiley Cochrane Library), MEDLINE (Ovid®), EMBASE® (Elsevier), and Science Citation Index Expanded through Web of Science™. The clinical trial registries, namely ClinicalTrials.gov and World Health Organization International Clinical Trials Registry Platform (http://apps.who.int/trialsearch) were also searched. The search terms included both text and medical subject heading (MeSH terms) [Supplementary Table]. Hand searching of the cross-references of the important studies was conducted to ensure that all relevant studies were identified. Google scholar and the conference proceedings were searched for additional information. The studies obtained by searching the literature were collated using the reference manager (EndNote X8), and duplicates were removed. We included studies meeting the following criteria: (1) adult patients with metastatic or locally advanced UC with Eastern Cooperative Oncology Group performance status ≤2; (2) intervention trials evaluating the efficacy and safety of PD-1 or PDL-1 inhibitors used alone but not in combination with other treatments; (3) noncomparative or comparative clinical studies; (4) i – At least one of the outcomes was assessed: objective response rate (ORR), median progression-free survival (PFS) and OS, ii – Additional efficacy outcomes such as median time to response, median doses of the drug required for response, median duration of response, disease control rate, PFS rate, and OS rate have been assessed, iii – Adverse events (AE) especially immune-mediated AEs (imAE) have been assessed for evaluating the safety of PD-1/PDL-1 inhibitors; and (5) the median follow-up duration was 5 months or more. The subgroup analyses were conducted for outcomes as per the PDL-1 expression status on the tumor cells or immune cells or both. Two authors SD and RR independently reviewed the manuscripts and abstracted the data against the predefined inclusion criteria. Data abstraction from the eligible studies was performed using a pilot-tested standardized data abstraction form. The extracted information included study identification, authors, phase of clinical trial, location, duration, design, participant characteristics, clinical setting, details of the intervention, sample size, duration of follow-up, outcome measures for both safety and efficacy, diagnostic tests employed to assess PDL-1 positivity status, translational biomarkers investigated and the sub-group analyses. All the information was compiled in standardized tables and disagreements were resolved by consensus. The analysis was finalized after thorough discussion among the review authors (SP, RM, AKM, and SKS). We searched for an appropriate tool to assess the risk of bias for the nonrandomized, noncomparative, single-arm studies. We also reviewed the studies based on the published data, nature of the outcomes assessed and the method of assessment. The heterogeneity in participant characteristics, interventions, and the PDL-1 diagnostic tests used were also noted. The Cochrane risk of bias tool (RoB 2) was used to evaluate the quality of randomized controlled trials (RCT). The Cochrane Handbook was consulted for data extraction. STATA (v12; StataCorp, USA) and Revman 5.3.5 (The Nordic Cochrane Centre, Copenhagen, Denmark) were used to analyze the data. The observed treatment effect was reported as pooled mean with 95% confidence interval (CI). I2 statistics was used to assess for heterogeneity amongst the included studies and a value ≥ 50% was considered significant for using random effect model. However, we used random effect model for all pooled analysis considering the clinical heterogeneity between the studies. The reported means for the treatment arms were pooled in STATA to calculate the median effect size with 95% CI. Categorical outcomes were analyzed using Cochrane Mantel–Haenszel method in Revman. The observed probability of achieving treatment response was reported as odds ratios (OR) with 95% CI. The data were presented in a descriptive manner when the computation of a pooled effect size was not feasible. The subgroup analysis was performed for only ORR but not others due to nonavailability of adequate data. Egger's plot was used to assess publication bias and Galbraith plot to investigate for heterogeneity. One thousand two hundred and eighty-four relevant studies were identified by systematic search of the databases, and the full texts of 115 studies were examined for eligibility. A total of 10 clinical trials including 3010 participants, conducted in 11 countries in North America and Europe were included in this systematic review. The systematic process of study selection is described in [Figure 1]. Two treatment categories were recognized (1) PD-1/PDL-1 inhibitors as second-line standalone treatment after disease progression with platinum-based chemotherapy: eight studies,,,,,,,, (2) PD-1/PDL-1 inhibitors as first-line treatment in cisplatin-ineligible: two studies,,. Studies were excluded if combination therapies were evaluated or the outcomes of interest were not reported, or the data for urothelial malignancy could not be retrieved from a basket type of trial design. Adaptive and pragmatic trials with shorter follow-up were also excluded. 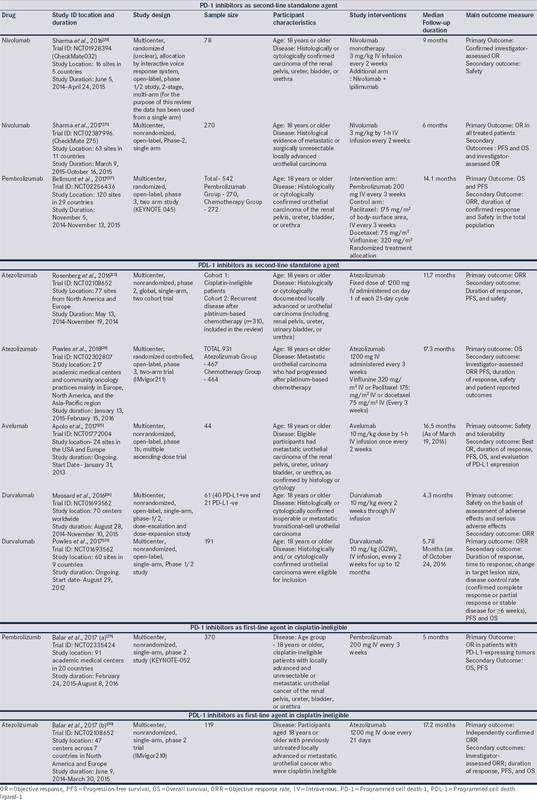 The summary information for the included studies is presented in [Table 1]. We were unable to assess the risk of bias for the eight nonrandomized, noncomparative, single-arm intervention trials due to lack of a predefined tool for bias assessment.,,,,,,,, However, the risk of bias in these studies was judged as moderate, based on the objective nature of the outcomes and the blinded review committee assisted assessment of the ORR in most of the studies. The RCTs, were judged to have mild-to-moderate risk of bias due to the open-label administration of the intervention and unmasked status of the outcome assessors [Supplementary Figure 1]. PD-1/PDL-1 inhibitors as second-line standalone: All the eight studies,,,,,,,, reported the ORR. The pooled ORR was 18.2% (95% CI 15.1–21.2, n = 1785) [Figure 2]. Two of the included studies were RCTs and included a second-line chemotherapy (vinflunine/paclitaxel/docetaxel) group as the control arm. The pooled ORR achieved with second-line chemotherapy was 12.6% (95% CI 10.3–14.9, n = 736). ORR with atezolizumab was found to be no better than second-line chemotherapy (13.4% [95% CI 10.5–16.9] vs. 13.4% [95% CI 10.5–16.9]), whereas pembrolizumab was found to be significantly better than chemotherapy (21.1 [95% CI 16.4–26.5] vs. 11.4% [95% CI 7.9–15.8]) in the settings of a RCT. PD-1/PDL-1 inhibitors as first-line treatment in cisplatin ineligible: There were two studies in this group., The estimated pooled ORR was 23.7% (95% CI 19.9–27.4, n = 489) [Figure 2]. Neither atezolizumab (2.1 months [95% CI 2.1–2.2] vs. 4.0 months [95% CI 3.4–4.2]) nor pembrolizumab (2.1 months [95% CI 2.0–2.,2] vs. 3.3 months [95% CI 2.3–3.5]) demonstrated advantage over the second-line chemotherapy for PFS in the RCT settings. PD-1/PDL-1 inhibitors as first-line treatment in cisplatin ineligible: The reported median PFS in the two clinical trials, ranged from 2.0 to 2.7 months (n = 310) [Table 2]. OS did not significantly differ between atezolizumab and second-line chemotherapy (11.1 months [95% CI 8.6–15.5] vs. 10.6 months [95% CI 8.4–12.2]) in RCT settings whereas pembrolizumab was reported to have a better median OS than second-line chemotherapy (10.3 months [95% CI 8.0–11.8] vs. 7.4 months [95% CI 6.1–8.3]). PD-1/PDL-1 inhibitors as first-line in cisplatin ineligible: OS was reported only for atezolizumab (n = 119) but not for pembrolizumab. The reported median OS was 15.9 months (95% CI 10.4 to NE) [Table 2]. The median time to response was reported in six out of eight trials in the second-line setting, and it ranged from 1.4 to 3.2 months.,,,, Similarly, it was reported in both the trials in the first-line setting and ranged from 2 to 2.1 months., None of the trials reported the median doses required to achieve the response. The median duration of response was not reached in eight out of ten trials, thereby meaning, an ongoing response in a subset of participants at trial closure. Disease control rate data could be retrieved from seven out of eight trials in the second-line treatment setting.,,,,,, The average disease control rate at 12 weeks was 42.1% ±8.8%. Out of the two RCTs, one reported the disease control rate with second-line chemotherapy as 48% at 12 weeks. In the first-line treatment setting, atezolizumab was reported to have the disease control rate of 46.7% at 12 weeks, but for pembrolizumab, this data was unavailable. The PFS and OS rates were not reported uniformly across the clinical trials. In the second-line setting, PFS rate was 21% (nivolumab), 16% (durvalumab), and 19.1% (avelumab) at 12 months. The OS rate at 12 months was 46%, 55%, 54.3%, 46.2%, and 41.2% with nivolumab, durvalumab, avelumab, atezolizumab, and second-line chemotherapy, respectively. None of the trials in the first line treatment setting reported PFS outcomes. Three out of ten studies assessed the expression of PDL-1 on tumor cells only,,, three on tumor-infiltrating immune cells only,,, and the rest on both types of cells and macrophages and expressed it as the combined positive score (CPS).,,, Studies used different cutoff criteria for PDL-1 positivity. Nivolumab, evaluated in second-line setting, with PDL-1 expression cut-off of 1%., The ORR was achieved in 25.7% (95% CI 20.2–31.7) of the participants with PDL-1 expression of >1% as compared to 16.9% (95% CI 11.3–22.6) with <1% expression [Figure 3]. However, the odds of achieving objective response were similar (OR = 0.65, 95% CI 0.35–1.53, n = 413) in both the groups [Figure 4]. The median PFS was 5.5 months in >1% group as compared to 2.8 months in <1% group. 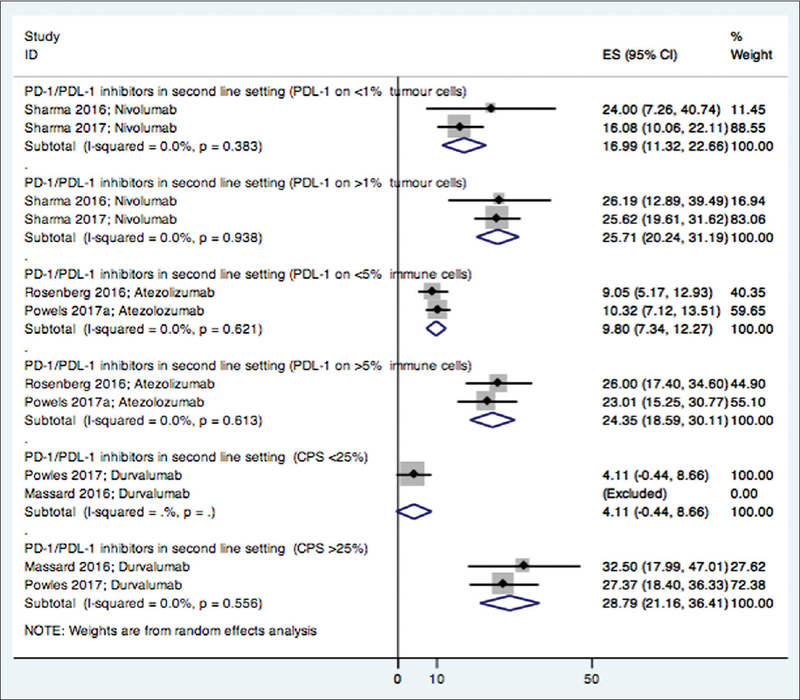 The median OS was 11.3 to 16.2 months in >1% group but 5.9 to 9.9 months in <1% group., No differences were observed in the outcomes when assessing atezolizumab in first-line setting with PDL-1 expression cut-off of 1% (23% vs. 21% in >1% PDL-1 expression group and <1% expression group, respectively). Avelumab evaluated in second-line standalone setting with PDL-1 expression of 5% as cutoff. ORR was achieved in 53.8% (95% CI 26.4–81.1) participants with >5% expression as compared to 4.2% (95% CI 0.8–7.6) in <5% expression [Figure 3]. The odds of achieving ORR were found to be marginally higher with higher PDL-1 expression (OR = 0.04, 95% CI 0.0–0.36, n = 37) [Figure 4]. The median PFS (12.1 months, 95% CI 2.8-NE vs. 1.7 months, 95% CI 1.5–3.0) and OS (NE, 95% CI 8.5-NE vs. 12.1 months, 95% CI 2.7-NE) were higher in participants with PDL-1 expression >5% as compared to <5%. However, no differences in ORR (28% vs. 23%), median OS (12.3 vs. 19.1 months) and OS rate at 12 months (52% vs. 59%) were observed for atezolizumab in the first line setting in >5% compared to <5% expression group. Atezolizumab evaluated in the second-line and first-line treatment setting using 1% expression as cutoff. The ORR was achieved in 17.9% (95% CI 13–24) participants with >1% expression as compared to 8% (95% CI 3–15) with <1% expression in the second-line setting whereas the corresponding numbers were 23.7% (95% CI 15–35) and 20.5% (95% CI 9–36) in the first-line setting. The odds of achieving ORR with >1% PDL-1 expression was found to be better (OR = 0.39, 95% CI 0.17–0.86, n = 310) in second-line but not in the first-line setting (OR = 0.44, 95% CI 0.16–1.22) [Figure 4]. The PFS and OS data were not available for this sub-group. Data were available for atezolizumab evaluated in the second-line standalone setting, as well as first-line setting using 5% PDL-1 expression as the cutoff. In the second-line setting, ORR was achieved in 24.3% (95% CI 18.5–30.1) participants with >5% expression as compared to 9.8% (95% CI 7.3–12.2) in <5% expression group [Figure 3] and the odds of achieving ORR was 0.34 (95% CI 0.22–0.52, n = 772) [Figure 4]. However, in the first-line treatment setting, the ORR (28% vs. 21%) and the odds of response were similar (OR = 0.67, 95% CI 0.26–1.69, n = 71). The median PFS and OS were reported only by Rosenberg et al. There was no difference in PFS between the groups. However, the median OS appeared to be longer with PDL-1 expression >5% (11.4 months, 95% CI 9-NE) as compared to <5% (6.6 months, 95% CI 4.4–8.8). This data wasobtained from the study by Balar et al. The ORR achieved with pembrolizumab, in the first-line setting, was 39% versus 20% and the odds of attaining ORR was also marginally higher in the group with CPS >10% compared to <10% (OR = 0.34, 95% CI 0.19–0.62, n = 265) [Figure 4]. The PFS and OS data were not available for this subgroup. Two trials evaluating durvalumab, used this cutoff criterion. The pooled ORR in the second-line treatment setting was 28.8% (95% CI 21.1–36.4) with CPS >25% compared to 4.4% (95% CI-0.4–8.6) in <25% group [Figure 3]. The odds of achieving ORR was somewhat higher in participants with high CPS (OR = 0.10, 95% CI 0.03–0.31, n = 229), [Figure 4]. Only Powles et al. reported median PFS and OS. The median PFS was 2.1 months (95% CI 1.4–2.8) versus 1.4 months (95% CI 1.3–1.5) and the median OS was 20 months (95% CI 11.6 to NE) versus 8.1 months (CI 3.1 to NE) in CPS expression >25% as compared to <25%. The safety analysis included all the 2268 participants from 10 studies. None of the studies reported the safety outcomes by PDL-1 expression status but only for the total cohort of participants treated. A mean of 69.1% ±7.9% participants experienced treatment-related AE, out of which 14.0% ± 5.8% were serious (Grade 3/4/5) in nature. Three studies reported no treatment-related deaths,, and the average number of death was 0.8% ± 0.8%. The mean rate of treatment discontinuation was 4.6% ±2.5%, and the most common reason was AEs due to the study drug. Dose disruption or delay in treatment administration was reported to be as high as 34%. The most common treatment-related AE was fatigue (21.5% ± 7.7%). The other common AEs were pruritus (12% ±7.5%), skin rash (7.1% ± 5.1%), diarrhea (8.6% ±3.3%), nausea (9.3% ± 3.1%), decreased appetite (8.2% ± 3.7%), arthralgia (3.9% ± 4.2%), and asthenia (5.1% ± 4.6%). No infusion-related AEs were reported for nivolumab, atezolizumab. These were 0.8% for pembrolizumab; 1%–3.2% for durvalumab and highest with avelumab (20.4%) [Table 3]. All the trials specifically looked for immune-related AE (imAE) induced by the PD-1/PDL-1 inhibitors. The onset of such imAE was reported to range from within a few weeks from the start of the treatment to several months after the end of the treatment. Skin and skin related AEs were the most common imAE [Table 4] and first ones to appear as reported in these trials. The other common imAE were hepatitis (4%–21.6%; 7/10 trials), pneumonitis (2.3%–12%; 9/10 trials), arthralgia (2.2%–12%; 6/10 trials), and thyroiditis or parathyroiditis (0.54%–8%; 5/10 trials). An immune-mediated inflammatory change in the central nervous system was reported with nivolumab (2%), atezolizumab (4%), and pembrolizumab (1.2%–1.8%). Uveitis was reported with avelumab (2.3%) and pembrolizumab (0.3%). The other imAE were infections, myalgia and hypersensitivity, and multi-organ dysfunctions [Table 4]. We tried to analyze the dose-response relationship between the drugs and the AE. The individual PD-1/PDL-1 inhibitor drugs were used as per the doses and intervals recommended by the manufacturers irrespective of second-line or first-line setting. The dosing schedule of nivolumab (3 mg/kg 1-h intravenous [IV] infusion every 2 weeks), pembrolizumab (200 mg IV every 3 weeks), atezolizumab (1200 mg IV administered every 3 weeks), avelumab (10 mg/kg 1-h IV infusion every 2 weeks), and durvalumab (10 mg/kg 1-h IV infusion every 2 weeks) varied significantly. As reported in majority of the clinical trials, the dose discontinuation, reductions and the change in the intervals were at the discretion of the treating physician. These are not described in sufficient detail so as to understand the type of AE leading to alteration in dosing. Therefore, the available evidence is insufficient to provide any meaningful insight in this regard. The diagnostic tests used for evaluating PDL-1 positivity status in the tumor tissue were (i) PDL-1 IHC 28-8 PharmDx detecting PDL-1 on tumor cells (Dako), (ii) SP-142 detecting PDL-1 on immune cells (Ventana), (iii) PDL-1 IHC 22C3 PharmDx (Dako) (iv) SP-263 (Ventana) detecting on tumor cells, macrophages, and immune cells. They were developed and validated alongside the development of nivolumab, atezolizumab, pembrolizumab, and durvalumab-avelumab, respectively. Two of the tests use rabbit monoclonal antibodies (SP-142 and SP-263) and the other two use mouse antibodies (22C3 and 28-8 pharmDx) All the tests require 4–5 mm thick fresh frozen paraffin-embedded tissue sections. The individual tests used specific cutoff criteria, namely IHC 28-8 PharmDx used 1% (tumor cells); SP-263 used 5% (tumor cells); SP-142 used 1, 1–5 and 5% (immune cells); and PDL-1 IHC 22C3 PharmDx used CPS score 10% or 25%. 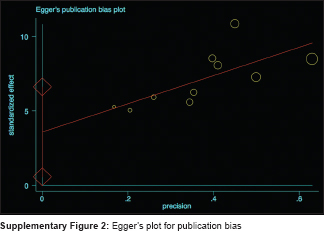 Egger's plot did not reveal significant publication bias [Supplementary Figure 2]. 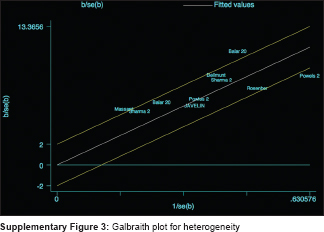 However, Galbraith plot demonstrated significant heterogeneity [Supplementary Figure 3]. PD-1/PDL-1 inhibitors are undoubtedly the most exciting addition to the therapeutic armamentarium of AdUCs, a field which has not witnessed major breakthroughs for almost three decades. The experience with these new class of agents is short, though they have demonstrated some promise by achieving better ORR in the participants with high PD-1/PDL-1 expression in the tumor tissue, in both, cisplatin-based regimen failure and cisplatin ineligibility. However, when the patients were treated irrespective of their tumor PD-1/PDL-1 expression status, the response rate was only marginally higher in the PD-1/PDL-1 treatment group in the second-line settings (18.2% vs. 12.6%, respectively compared to that of chemotherapy) and in the first-line setting in cisplatin ineligible (ORR in PD-1/PDL-1 treatment group was 23.78%; no comparative data for alternative chemotherapy). We also evaluated the OS and PFS, since ORR is not universally regarded as the best indicator of anti-cancer drug efficacy, even though the FDA recognizes it as a valid surrogate marker for drug approvals in short-term single-arm clinical trial when there is an unmet need. The median PFS does not appear to be better with PD-1/PDL-1 inhibitors compared to the second-line chemotherapy (1.5–2.9–3.3–4.0 months). The median PFS was found to be similar with PD-1/PDL-1 inhibitors, in first-line and second-line setting (1.5–2.9 vs. 2.0–2.7 months) in the single arm studies. However, the available data indicates that the median OS may be longer with use of these agents as compared to second-line chemotherapy (7.9–18.2 vs. 7.4–8.0 months). Nevertheless, we consider the evidence as weak as it was inconsistent across the studies., Moreover, the possibility of a selection bias in an open label single arm early phase clinical trials cannot be ruled out. Of the two RCTs, Powles et al. did not find any difference between PFS and OS, but Bellmunt et al. did report a marginal increase in OS with PD-1/PDL-1 inhibitors although the PFS was similar to chemotherapy. This could be due to the non-stringent entry criteria (the patients in the PD-1/PDL-1 treatment groups did not have a cutoff for tumor PDL-1 expression to enter into the clinical trial) or a purely drug specific effect. Overall, there was a notable heterogeneity in the clinical response to the drugs. It is also unclear at this point, whether the short-term benefit with PD-1/PDL-1 inhibitors would translate into long-term survival benefit if the patients are treated irrespective of the PDL-1 expression status in the tumor tissue. Further, the remaining period of survival beyond the PFS (till the total period of survival, which is reported be 6–16 months or more), may be burdened with the long-term imAE induced by these drugs, further compromising the quality of life. These drugs are expensive; hence a modest gain in PFS with an extended OS with poor quality of life, is likely to reduce quality-adjusted life years (QALY) gained along with an added cost of treatment. None of the clinical trials included in this systematic review and meta-analysis addressed this issue. The QOL as well as QALY are important outcomes which need to be considered before these drugs are designated as the standard of care. In terms of efficacy outcomes when stratified by PDL-1 expression status, PDL-1 expression on the tumor cells alone or immune cells alone with a cutoff of 1% failed to predict ORR consistently. Even when the cutoff for expression was increased to 5%, there was an inconsistent indication for predictability of response.,, CPS seems to have emerged as a better predictor of response to treatment with PD-1/PDL-1 inhibitors in all settings.,, However, this biomarker was employed only in studies evaluating pembrolizumab but not the other agents. None of the studies mentioned how many of the patients had null expression status, and their outcomes. Currently, it is believed that lack of expression of PDL-1 should not preclude treatment with these agents as some of the patients with negative expression have also exhibited responses. It could have been interesting to compare the outcomes in PD-1/PDL-1-negative versus positive patients, with respect to safety and survival. Another limitation is that four different testing methods have been developed parallel to the development of PD-1/PDL-1 inhibitors either as companion or complementary diagnostic test. However, skepticism has been expressed over the interchangeability of the tests, as they may differ in their sensitivities.,, In addition, there are concerns over the dynamic and heterogeneous nature of the PDL-1 expression, which may vary in different regions of the tumor and between the primary tumor and the metastatic lesions.,, The data on PDL-1 testing as a prognostic and predictive biomarker are still evolving. Although there is no consensus at present regarding the best PDL-1 testing method and the cutoff to define positivity, CPS as a predictive biomarker needs further validation in a larger cohort of patients and across all the approved agents. PD-1/PDL-1 inhibitors have been proposed to be better tolerated due to their targeted action unlike the other immune checkpoint inhibitors such as CTLA-4. CTLA-4 targets the cytotoxic T-lymphocyte antigen reducing the T-cell function at a proximal step unlike the PD-1/PDL-1, which inhibit the T-lymphocyte function at a later stage, which may explain their better tolerability. In this systematic review, approximately 70% of the patients reported treatment-related AEs and about one-fourth of them were serious in nature, though the rate of treatment discontinuation was only 5%–10%. It is worth appreciating that the median duration of treatment was as short as 2.8–3.6 months (reported only in 5 studies); but the total duration of treatment ranged from 0 to 35.5 months. Thereby meaning that the majority of the patients could not tolerate the drug beyond 3–4 months, which itself indicates poor tolerability. Some of the patients could tolerate therapy for as long as 35.5 months, however, it is unclear whether it is the general health of the patients (ECOG performance status) or PDL-1 positivity status or the response to the disease that determines tolerability to the drug. These details have not been reported in the published literature. Similarly, it is unclear at this time that if a dose-response relationship exists for the AEs. The imAEs were as high as 21% and included several organ systems. Skin rash was the commonest and first to appear, but other more severe ones affecting critical neuroendocrine organs appeared over a period of weeks to months. The course of these imAEs and their association with dose of PD-1/PDL-1 inhibitors is unknown. There is no consensus at this time, whether their onset is an indication to stop further treatment. The available evidence is also inadequate to suggest whether the imAEs have a bearing with the extent of PDL-1 expression similar to efficacy or not. Moreover, there is no data on the adverse effects in tumors without PD-1/PDL-1 expression, which could have helped us to understand the true expression of imAEs. The iatrogenic AEs such as arthralgia and myalgia may also potentially compromise the quality of life during the extended period of survival. Further research is also required to characterize the imAEs and define strategies to manage them effectively. Moreover, all the included studies involved management of UCs as a whole, while tumors at specific sites such as upper tract urothelial tumors or bladder urothelial tumors might have differential effects and efficacy and this could also be one of the future areas of further investigation. 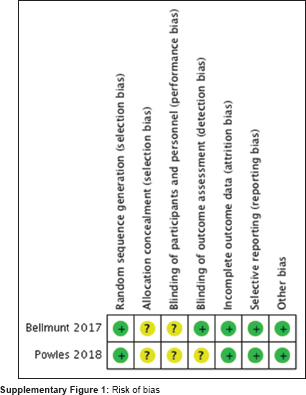 In this systematic review, we were unable to apply Grading of Recommendation Assessment, Development, and Evaluation to rate the quality of evidence since the risk of bias for eight of the ten included studies could not be assessed due to unavailability of a validated tool. Drugs and biologic agents being developed for advanced stages of malignancy are invariably tested in nonrandomized single arm interventional studies, where there is no control arm. This is a more intuitive study design in this scenario than a RCT. 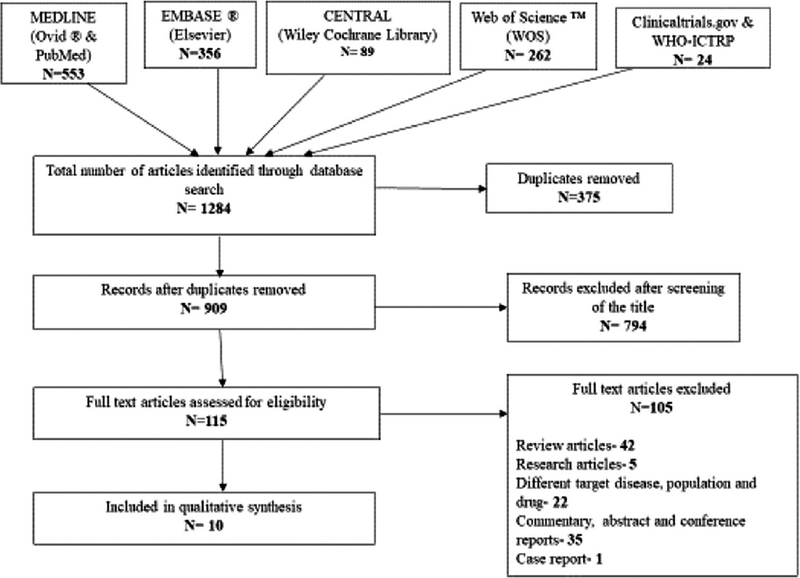 Since the new drug approvals and subsequent treatment of patients are based on the data obtained from such studies, there is an unmet need to devise an instrument (tool) and validate it to assess the of risk of bias in randomized single arm interventional studies to improve the robustness of systematic review process. Future research is required to address several aspects of PD-1/PDL-1 inhibitor use in AdUC. Assays for the assessment of PD1/PD-L1 expression on both tumor cells and immune cells need to be standardized. It is imperative to characterize the responder profile with biomarkers upfront before therapy initiation to maximize the benefits obtained. The optimum duration of therapy, discontinuation criteria and imAEs also need more investigation. The impact on the quality of life of the patients who respond to therapy and have long OS even with disease progression need more clarity to make an informed choice about the treatment. The health economics aspects of treatments also need to be better understood. PD-1/PDL-1 inhibitors appear to be promising in the treatment of AdUCs with higher PDL-1 expression and the concept of a cutoff value for the same is still evolving. CPS may be considered as a potentially reliable biomarker for predicting response to these agents but need further validation as a universal biomarker for making treatment decisions. Caution needs to be exercised until more data are available on the long-term imAEs and further studies are required to prove their worthiness as a standard of care. Authors thank ICMR- Advanced Center for Evidence-Based Child Health, Department of Pediatrics, PGIMER for helping in carrying out database search. Authors also thank Department of Biotechnology, Govt. of India for providing fellowship to Sumit Dey for his PH.D. programme. De Santis M, Bellmunt J, Mead G, Kerst JM, Leahy M, Maroto P, et al. Randomized phase II/III trial assessing gemcitabine/carboplatin and methotrexate/carboplatin/vinblastine in patients with advanced urothelial cancer who are unfit for cisplatin-based chemotherapy: EORTC study 30986. J Clin Oncol 2012;30:191-9. Bellmunt J, Théodore C, Demkov T, Komyakov B, Sengelov L, Daugaard G, et al. Phase III trial of vinflunine plus best supportive care compared with best supportive care alone after a platinum-containing regimen in patients with advanced transitional cell carcinoma of the urothelial tract. J Clin Oncol 2009;27:4454-61. Vaughn DJ, Broome CM, Hussain M, Gutheil JC, Markowitz AB. Phase II trial of weekly paclitaxel in patients with previously treated advanced urothelial cancer. J Clin Oncol 2002;20:937-40. Galsky MD, Mironov S, Iasonos A, Scattergood J, Boyle MG, Bajorin DF, et al. Phase II trial of pemetrexed as second-line therapy in patients with metastatic urothelial carcinoma. Invest New Drugs 2007;25:265-70. McCaffrey JA, Hilton S, Mazumdar M, Sadan S, Kelly WK, Scher HI, et al. Phase II trial of docetaxel in patients with advanced or metastatic transitional-cell carcinoma. J Clin Oncol 1997;15:1853-7. Raggi D, Miceli R, Sonpavde G, Giannatempo P, Mariani L, Galsky MD, et al. 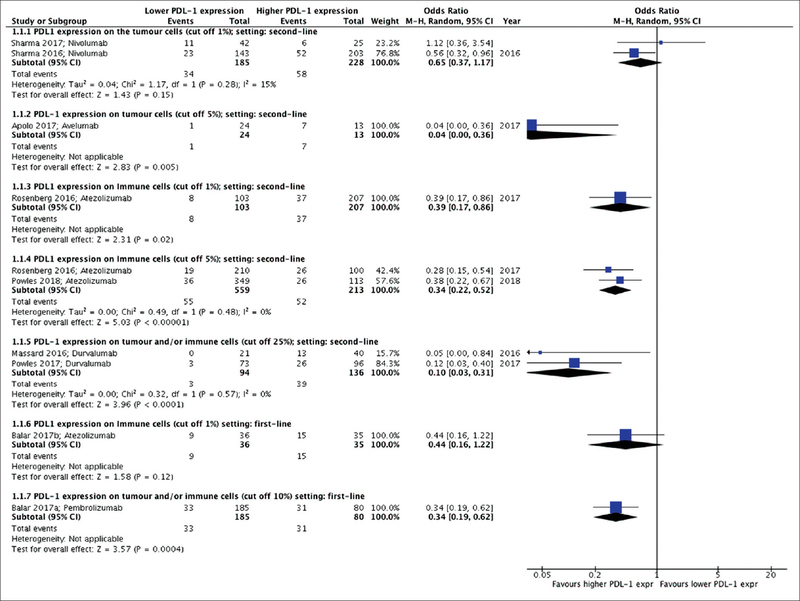 Second-line single-agent versus doublet chemotherapy as salvage therapy for metastatic urothelial cancer: A systematic review and meta-analysis. Ann Oncol 2016;27:49-61. Bellmunt J, Mullane SA, Werner L, Fay AP, Callea M, Leow JJ, et al. Association of PD-L1 expression on tumor-infiltrating mononuclear cells and overall survival in patients with urothelial carcinoma. Ann Oncol 2015;26:812-7. Patel SP, Kurzrock R. PD-L1 expression as a predictive biomarker in cancer immunotherapy. Mol Cancer Ther 2015;14:847-56. FDA Approves Immunotherapy for Bladder Cancer; 30 June, 2017. Available from: https://www.cancer.gov/news-events/cancer-currents-blog/2017/approvals-fda-checkpoint-bladder. [Last accessed on 2018 Jan 15]. Guidance for Industry: Clinical Trial Endpoints for the Approval of Cancer Drugs and Biologics. Available from: https://www.fda.gov/downloads/Drugs/Guidances/ucm071590.pdf. [Last accessed on 2017 Dec 01]. Sterne JA, Hernán MA, Reeves BC, Savović J, Berkman ND, Viswanathan M, et al. ROBINS-I: A tool for assessing risk of bias in non-randomised studies of interventions. BMJ 2016;355:i4919. Higgins JPT, Altman DG, Sterne JAC. Assessing risk of bias in included studies. In: Higgins JPT, Green S editor (s). Cochrane Handbook for Systematic Reviews of Interventions Version 5.1.0 (updated March 2011). London, UK: Cochrane Wiley-Blackwell Publication, 2011. The Nordic Cochrane Centre, The Cochrane Collaboration. Review Manager (RevMan). 5.3. 5. Copenhagen: The Nordic Cochrane Centre, The Cochrane Collaboration; 2014. Sharma P, Callahan MK, Bono P, Kim J, Spiliopoulou P, Calvo E, et al. Nivolumab monotherapy in recurrent metastatic urothelial carcinoma (CheckMate 032): A multicentre, open-label, two-stage, multi-arm, phase 1/2 trial. Lancet Oncol 2016;17:1590-8. Powles T, O'Donnell PH, Massard C, Arkenau HT, Friedlander TW, Hoimes CJ, et al. Efficacy and safety of durvalumab in locally advanced or metastatic urothelial carcinoma: Updated results from a phase 1/2 open-label study. JAMA Oncol 2017;3:e172411. Massard C, Gordon MS, Sharma S, Rafii S, Wainberg ZA, Luke J, et al. Safety and efficacy of durvalumab (MEDI4736), an anti-programmed cell death ligand-1 immune checkpoint inhibitor, in patients with advanced urothelial bladder cancer. J Clin Oncol 2016;34:3119-25. Apolo AB, Infante JR, Balmanoukian A, Patel MR, Wang D, Kelly K, et al. Avelumab, an anti-programmed death-ligand 1 antibody, in patients with refractory metastatic urothelial carcinoma: Results from a multicenter, phase Ib study. J Clin Oncol 2017;35:2117-24. FDA Grants Accelerated Approval to Avelumab for Urothelial Carcinoma. The Full Prescribing Information for Avelumab in Bladder Cancer could be Found. Available from: https://www.accessdata.fda.gov/drugsatfda_docs/label/2017/761078s000lbl.pdf. [Last accessed on 2017 Dec 05]. Powles T, Durán I, van der Heijden MS, Loriot Y, Vogelzang NJ, De Giorgi U, et al. Atezolizumab versus chemotherapy in patients with platinum-treated locally advanced or metastatic urothelial carcinoma (IMvigor211): A multicentre, open-label, phase 3 randomised controlled trial. Lancet 2018;391:748-57. Balar AV, Castellano D, O'Donnell PH, Grivas P, Vuky J, Powles T, et al. First-line pembrolizumab in cisplatin-ineligible patients with locally advanced and unresectable or metastatic urothelial cancer (KEYNOTE-052): A multicentre, single-arm, phase 2 study. Lancet Oncol 2017;18:1483-92. Balar AV, Galsky MD, Rosenberg JE, Powles T, Petrylak DP, Bellmunt J, et al. Atezolizumab as first-line treatment in cisplatin-ineligible patients with locally advanced and metastatic urothelial carcinoma: A single-arm, multicentre, phase 2 trial. Lancet 2017;389:67-76. Levy A, Massard C, Soria JC, Deutsch E. Concurrent irradiation with the anti-programmed cell death ligand-1 immune checkpoint blocker durvalumab: Single centre subset analysis from a phase 1/2 trial. Eur J Cancer 2016;68:156-62. Plimack ER, Bellmunt J, Gupta S, Berger R, Chow LQ, Juco J, et al. Safety and activity of pembrolizumab in patients with locally advanced or metastatic urothelial cancer (KEYNOTE-012): A non-randomised, open-label, phase Ib study. Lancet Oncol 2017;18:212-20. Powles T, Eder JP, Fine GD, Braiteh FS, Loriot Y, Cruz C, et al. MPDL3280A (anti-PD-L1) treatment leads to clinical activity in metastatic bladder cancer. Nature 2014;515:558-62. Cree IA, Booton R, Cane P, Gosney J, Ibrahim M, Kerr K, et al. PD-L1 testing for lung cancer in the UK: Recognizing the challenges for implementation. Histopathology 2016;69:177-86. Hirsch FR, McElhinny A, Stanforth D, Ranger-Moore J, Jansson M, Kulangara K, et al. PD-L1 immunohistochemistry assays for lung cancer: Results from phase 1 of the blueprint PD-L1 IHC assay comparison project. J Thorac Oncol 2017;12:208-22. Vilain RE, Menzies AM, Wilmott JS, Kakavand H, Madore J, Guminski A, et al. Dynamic changes in PD-L1 expression and immune infiltrates early during treatment predict response to PD-1 blockade in melanoma. Clin Cancer Res 2017;23:5024-33. Madore J, Vilain RE, Menzies AM, Kakavand H, Wilmott JS, Hyman J, et al. PD-L1 expression in melanoma shows marked heterogeneity within and between patients: Implications for anti-PD-1/PD-L1 clinical trials. Pigment Cell Melanoma Res 2015;28:245-53. Sundahl N, De Wolf K, Rottey S, Decaestecker K, De Maeseneer D, Meireson A, et al. Aphase I/II trial of fixed-dose stereotactic body radiotherapy with sequential or concurrent pembrolizumab in metastatic urothelial carcinoma: Evaluation of safety and clinical and immunologic response. J Transl Med 2017;15:150. Relationship between Tumor Mutation Burden and Predicted Neo-antigen Burden in Patients with Advanced Melanoma or Bladder Cancer Treated with Nivolumab or Nivolumab Plus Ipilimumab (CA209-260). Available from: https://www.clinicaltrials.gov/ct2/show/NCT02553642?term=NCT02553642 and rank=1. [Last accessed on 2018 Apr 21]. Cabozantinib-s-Malate and Nivolumab with or without Ipilimumab in Treating Patients with Metastatic Genitourinary Tumors. Available from: https://www.clinicaltrials.gov/ct2/show/NCT02496208?term=NCT02496208&rank=1. [Last accessed on 2018 May 21]. A Phase 1/2 Study of in Situ Vaccination with Tremelimumab and IV Durvalumab Plus PolyICLC in Subjects with Advanced, Measurable, Biopsy-accessible. Available from: https://www.clinicaltrials.gov/ct2/show/NCT02643303?term=NCT02643303&rank=1. [Last accessed on 2018 May 21]. 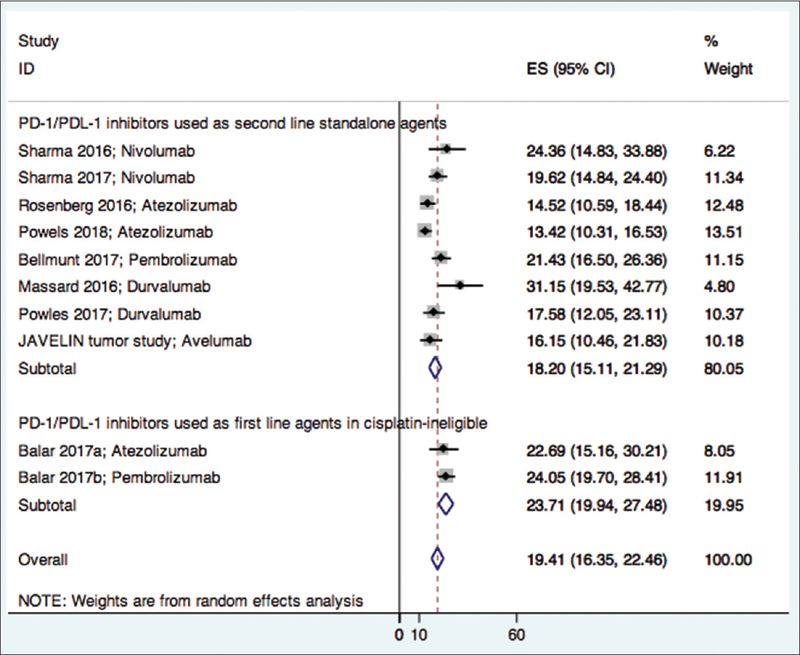 Martinez Chanza N, Roumeguere TA, Sideris S, Gil T, Peltier A, Awada A. Avelumab as neoadjuvant therapy in subjects with muscle-invasive urothelial carcinoma (AURA trial). J Clin Oncol 2018;36(suppl):TPS535-. Apolo AB, Infante JR, Hamid O, Patel MR, Wang D, Kelly K, et al. Safety, Clinical Activity, and PD-L1 Expression of Avelumab (MSB0010718C), an anti-PD-L1 Antibody, in Patients with Metastatic Urothelial Carcinoma from the JAVELIN Solid Tumor phase Ib Trial. J Clin Oncol 2016;34(suppl):367. Tzeng A, Diaz-Montero CM, Rayman PA, Kim JS, Pavicic PG, Finke JH, et al. Immunological Correlates of Response to Immune Checkpoint Inhibitors in Metastatic Urothelial Carcinoma. Target oncol 2018;13:599-609. Necchi A, Briganti A, Raggi D, Giannatempo P, Mariani L, Messina A, et al. Interim Results from PURE-01: A Phase 2, Open-Label Study of Neoadjuvant Pembrolizumab (pembro) Before Radical Cystectomy for Muscle-Invasive Urothelial Bladder Carcinoma (MIUC). J Clin Oncol 2018;36(suppl):TPS533. Tzeng A, Diaz-Montero CM, Rayman PA, Kim JS, Pavicic PG, Finke J, et al. Serial Changes in PD1/PDL1 Expression in Metastatic Urothelial Carcinoma Patients Treated with Immune Checkpoint Blockade. J Clin Oncol 2018;36(suppl):109. Parikh M, Pan CX, Beckett L, Li Y, Robles D, DeVisser C, et al. Combination Checkpoint Immunotherapy and Cytotoxic Chemotherapy: Further Results from a Phase Ib/II trial of Pembrolizumab and Docetaxel or Gemcitabine in Patients with Advanced or Metastatic Urothelial Cancer. L Clin Oncol 2018;36(suppl): 525. Schünemann H, Bro-ek J, Guyatt G, Oxman A, editors. GRADE Handbook for Grading Quality of Evidence and Strength of Recommendations. Updated October 2013. The GRADE Working Group; 2013. http://www.guidelinedevelopment.org/handbook. (accessed on 23 January 2017).